Back to the Future, Part 2: Sexism Today? Nah. The new report on the status of women in the United States, produced by the research firm PerryUndem, provides invaluable insight for us on the eve of the 2017 Women's March. The report summary includes 21 points and a wide variety of revealing graphics. You can read the summary and download the entire report by clicking here. Men who identify as Republican (12% of the population) . . . are among the least likely to perceive gender inequality: 39% say full equality has been achieved for women (v. 20% for all adults). Nearly two-thirds (64%) believe women have equal or more financial stability than men (v. 43% for all adults). Close to half (46%) say there are equal or more women in positions of power in society than men (v. 34%). [Hey, dudes, read this!] 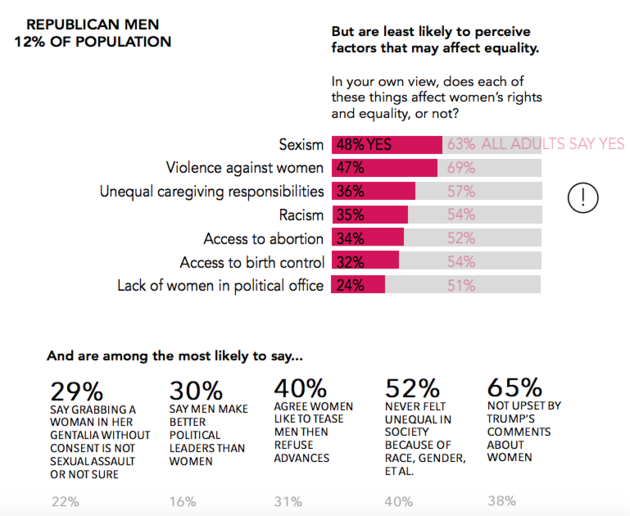 Republican men are more likely to say that it is a good time to be a woman in America (51%) than a man (41%)--(compared to 37% and 53% among all adults). As for me? HAHAHAHAHAHAHAHAHAHAHA! I'm laughing because I really just want to cry. For Part 1 of Back to the Future, click here!